Blades are broken into pieces. Palm-sized pieces are ready for the grinder. PULLMAN, Wash. – How many giant wind turbine blades can your local landfill accommodate? 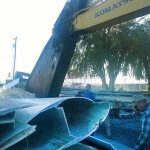 To help avert such a problem, Washington State University is working with Seattle-based Global Fiberglass Solutions Inc. (GFS) to recycle and manufacture composite fiberglass material from the decommissioned blades. 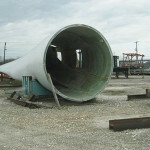 As the wind energy industry grows, more companies must deal with disposing of the 22,000-pound, 170-foot blades, which have an average lifespan of 18 years. Each wind turbine uses three of them. “Talk about clean energy – that’s enough garbage to really fill a landfill,’’ said Karl Englund, a research associate professor at WSU’s Voiland College of Engineering and Architecture who has spent more than a decade finding innovative solutions for waste materials in the Composite Materials Engineering Center. The trick to creating a successful recycling effort is to keep the process economical and simple, he said. Fancy thermal or chemical treatments, for instance, will raise the cost of recycling. For their project, GFS cut down wind turbine blades into palm-size pieces that WSU researchers refined by grinding and milling, processed into new composite materials and tested. The WSU team determined that the materials held up well compared to many wood composites. 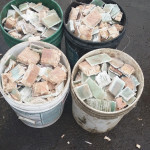 A finished product from the recycled blades could have a variety of applications, from floor tiles to plastic road barriers. GFS recently began working with Janicki Industries to move forward with the project. Based in Washington’s Skagit Valley, Janicki builds high-precision parts from composite materials for aerospace, marine, energy, space, military, transportation and architecture customers. The WSU researchers also recently completed a project with Triumph Composites Systems in Spokane, Wash., to recycle carbon fiber composite materials used in many airplane parts, such as for flooring and ventilation. Supported by a grant through the Joint Center for Aerospace Technology and Innovation (JCATI), Englund used low-energy methods to reprocess the composite materials to create potential new parts. JCATI was established in 2012 to support the aerospace industry in Washington state.